One day in high school, a bunch of us were leaving Jim’s office, and out of nowhere, apropos nothing, April goes, “Ummm… Mexican food is hella good.” It was probably junior or senior year by then, but I remember thinking in that moment that April’s terse observation pretty much summed up my culinary knowledge up to that point in my life. And I think it underscores everything I’ve truly felt about food since then. Mexican food is hella good. And going into the Peace Corps, one of the biggest warnings I received from friends who’d lived outside of California was Mexican food other places just doesn’t compare. Washington D.C., Boston, France—even New York City or Spain—once you get out of California, Mexican cuisine goes out the window. And, no offense to Samoa, but this has rung true for the island. Homemade tortillas and canned black beans are a Peace Corps staple, which is cool, and they definitely suffice in a land with no Mexican food, but my heart does miss a good burrito. 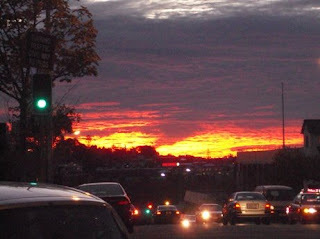 It was in this state of mind that I headed to dinner tonight to a restaurant on the Mexican waterfront called Mexicali. The place has big signs just inside the door boasting that it won best Mexican food in Auckland in 2007 and 2008. Sounds good to me. I’ve seen a couple other places in town—one across the street from the Sky Tower and one yesterday in Ponsonby—but this place claims to be the best. So we’ll see how it goes. The first thing I noticed was the guy behind the counter was clearly American. His accent and the way he carried himself were clearly mid-west. I wasn’t sure how to feel about that. On one hand, it seemed an American would be more in tune with Mexican food than a Kiwi. On the other hand, the guy couldn’t properly pronounce “guacamole,” and it made me nervous. I ordered a barbecue beef burrito, and added the unpronounceable guacamole for good measure. The customer queue overlooks the burrito assembly line, and most of the process seemed legit, save for some strange plastic canisters full of goo and/or powder. They had a full assortment of Mexican beer, except for my favorite, Pacifico. Oh well. I ordered a Dos Equis. As I was fishing money out of my wallet (Luisa eventually paid), the one Kiwi who was in the dining area asked the ex-patriated Wisconsinite for some ketchup. The poor guy was eating there, just him and his two kids, and he felt ketchup was the only solution for convincing his daughter to finish her meal. Looking back, it probably made life more difficult for the Kiwi, but I’m still impressed they didn’t keep ketchup on hand. 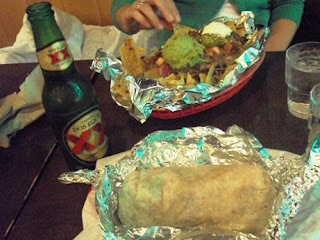 The burrito was mediocre, as were the nachos Luisa ordered, but mediocre is a lot more appealing than non-existent. And who cares if the burrito was mediocre? I still inhaled it. Anyone who’s ever eaten with me at Taco Bell or Del Taco or The Burrito Shop or Maya Burrito or Tacos Del Mar or El Burrito Express will attest to the fact that I can gulp down a burrito, no matter the size, in 60 seconds or less. So in that sense, I guess Auckland’s Mexicali passes the test. Its one true fault was the Dodgers logo on the wall. But I guess that’s something that southern California hasn’t figured out yet either, God help them. 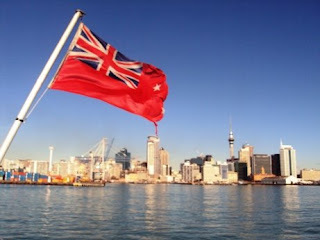 Auckland, as seen from our ferry yesterday. you made me hungry. i am googling "burrito" and "san jose" immediately after I post this comment.